I first discovered Smaller and Smaller Circles when it was announced that it was going to be turned into a film. And it’s hard not to be attracted to the links being posted on Facebook. The film was advertised as two Jesuit priests who investigate a serial killer. It’s not something that happens every day in Philippine cinema (or in real life), but what surprised me the most was that the book came out in 1998, and a lot of my friends have read it. My first question: how did I miss what is called the first Filipino crime novel? To give you a brief background of the book (if you’re not one of the cool kids who have read it already), Smaller and Smaller Circles follows Fathers Gus Saenz and Jerome Lucero, two priests who investigate a series of murders of young boys in Payatas. Aside from the murders, the novel deals with poverty and the ineptitude of the National Bureau of Investigation (NBI). In fact, what gave me more chills was how the latter still seems to apply today, even if the book first came out 18 years ago. It’s a sentiment that Batacan acknowledged in my edition’s acknowledgement. She said, “The first time I wrote this book – in 1996, when I was in my mid-twenties – I was angry: angry about my job, about the state of my country, about the callousness, complacency, and corruption that had dragged it there. It’s this ineptitude that drives the two priests to take matters into their own hands. Batacan makes a great argument about the oft-told belief that there are no serial killers in the Philippines. I first read it in Jessica Zafra’s Twisted, when she said that serial killers can’t exist here because they need a lot of privacy. Filipino neighbors and families are nosy, and any signs of deviant behavior will elicit visits and whispering. Batacan counters that there are serial killers, but our police force don’t have the skill set to recognize and track them down. Smaller and Smaller Circles is good. So good that it won the Carlos Palanca Grand Prize for the English Novel in 1999, the National Book Award in 2002, and the Madrigal-Gonzalez Award in 2003. The story is fleshed-out well, with the reader getting to know each character intimately. You can tell that Batacan spent a lot of time researching and lovingly writing each chapter, and you can see this in the cadence of the work, which sometimes reads like poetry. Smaller and Smaller Circles is also unusual in that the killer is announced halfway through the book. Usually, the grand reveal is in the last few chapters or frames, but Batacan follows her characterization by building up her killer. 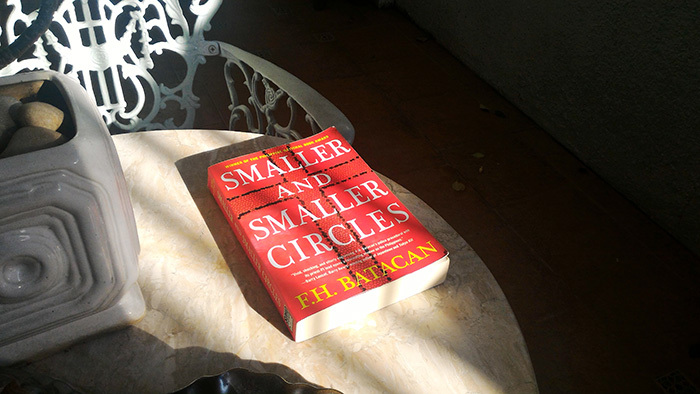 Like the title, the story is told in smaller and smaller circles until you reach the climax. However, there is a rushed quality to the second part of the book. It took me a while to finish this book (life happened), but I enjoyed reading it. The way it is written is engrossing, and it proves that knowing who the killer is halfway can be satisfying, too. I’m excited to see the film adaptation directed by Raya Martin and starring Nonie Buencamino, Sid Lucero, Carla Humphries, Christopher de Leon, and Bembol Roco. The adaptation has a lot to live up to, but Martin has an interesting filmography. It took me a while to finish reading, but at least the movie won’t be too far off.